Go, Receipt Racer, Go! | OhGizmo! Created by undef’s Martin Fuchs and Philip Whitfield in collaboration with Joshua Noble, Receipt Racer is almost an homage to old-school top-down racing games like Lemans on the Commodore 64. But instead of staring at an antiquated CRT while you play, the randomly generated course for Receipt Racer is continuously spewed forth from a thermal receipt printer. 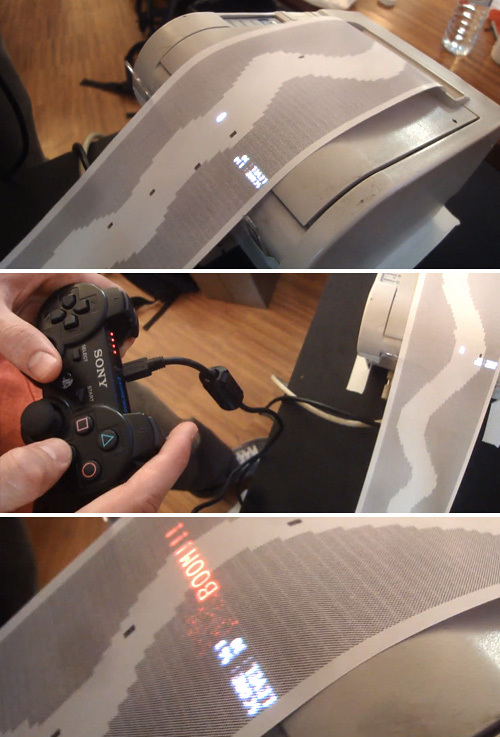 Your vehicle, including your score and progress, are projected onto the paper from above, while a hacked PS2 controller still gives the game that electronic video game feel. Each run is limited to about 164 feet (50 meters) since that’s how long each paper roll is, and its creators are well aware of how un-ecologically friendly the game is. So they just pass it off as being a commentary on how un-ecofriendly real automobiles are. The components of Receipt Racer, including the printer, projector and controller, are all wired into a laptop which all have to be properly calibrated and synced at the start to ensure the ‘vehicle’s’ progress and collisions can be detected. And in the event you do hit the wall or another car, a red “BOOM!! !” and a small pixelated explosion illustrate your demise, while your race stats are printed out at the end of the course.